Offer your deepest sympathies with a tribute from the heart. 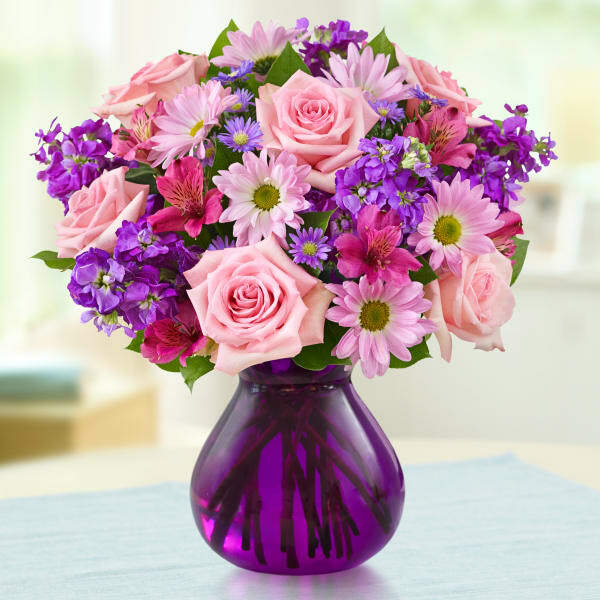 Send this lovely bouquet of lovely roses, daisy poms, stock, alstroemeria and monte casino in shades of pink and purple to the home or service to show your care and concern during times of sorrow. • Hand-crafted arrangement of roses, daisy poms, alstroemeria, stock, monte casino and salal. • Artistically designed by our expert florists in a chic purple glass vase; measures 7"H.
Flowers will be received by a Freeman Harris Funeral Home's staff. All of our flowers are designed and delivered by hand from a local florist in in Rockmart.